I've never really been one to explore dip sandwiches outside of the classic French Dip definition. I had a lamb dip once in Portland, OR, but that's about as far outside the beef, bread, and au jus realm as I've gone. One of my favorite local joints in Charlotte is called Leroy Fox - a casual but cool chicken-centric restaurant. They are known for their fried chicken and their chicken breast sandwiches. But those are just a piece of chicken between two pieces of bread with various seasonings and accoutrements. 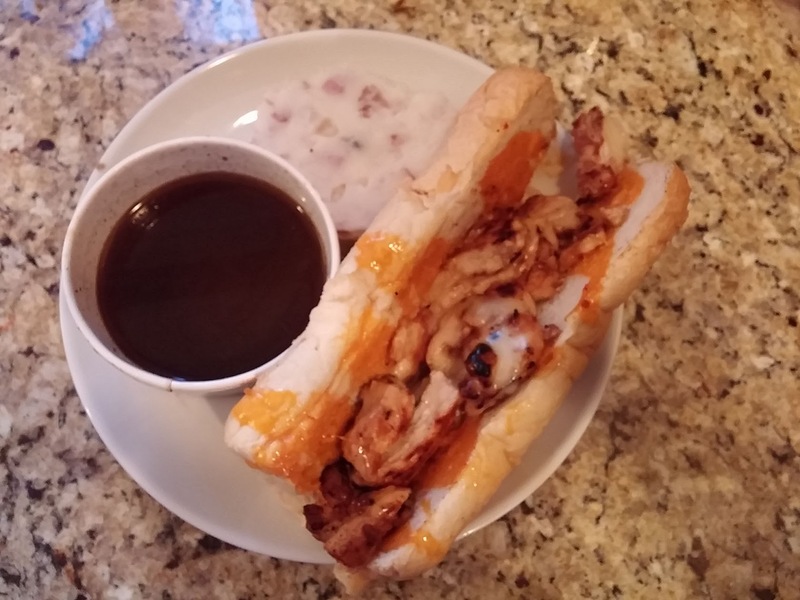 Though everything I've had there has been excellent, I had cautiously avoided the Sweet Caroline Dip - chopped grilled chicken breast on a hoagie with au jus. I write for a French Dip blog, so how could I not get a dip sandwich if one was offered? As a preface to my review of this sandwich, I have to say that I am a proud father of my 18-month-old boy, Grayson. Unfortunately, having an 18-month old boy makes going out to a nice dinner quite the challenge. I try to enjoy most of my French Dip encounters while I am travelling on business and I don't have to wrestle a 30-pound, 3-foot tall little man, who wants to personally meet and interact with everyone in the restaurant, back to his seat every 6 minutes. So while not on the road, the answer is: delivery. With Postmates, GrubHub, and Charlotte's own (and best) service, Foodie Call, that makes getting restaurant food delivered fast quite easy for a parent. So please accept my "self-plated" photos. I'm sure it looks better in the restaurant. could this possibly compare to the beef version? Tonight, I decided to take the plunge. We were ordering in from Leroy Fox. I write for a French Dip blog, so how could I not get a dip sandwich if one was offered? I feared the worst. I mean, a grilled chicken "French Dip" - how could this possibly compare to the beef version? Is the "jus" just chicken broth? I don't know what to expect! Well, I have to admit fault, and now I am slapping myself in the face for every time I have been to this restaurant and not ordered this sandwich. It was simply incredible - one of the best sandwiches - dips or otherwise - that I have ever had. First off, the au jus was not chicken broth - it was a tasty, herby beef jus with just the perfect amount of saltiness. What a surprise to open that take-out container and see rich, almost opaque beef broth when I expected something nearly transparent. probably looks nicer if you order it at the restaurant! The sandwich itself was probably perfectly fine without the broth, but I forgot to take a bite without dipping because the jus was so delicious. 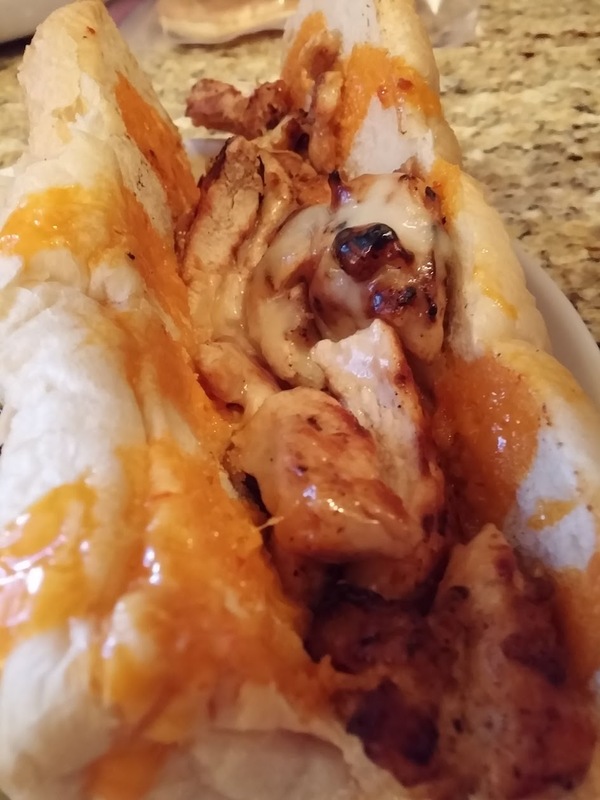 Large chunks of perfectly juicy, grilled, and seasoned chicken on a buttery hoagie roll (not crunchy, but not too soft), with Swiss cheese and an amazing "boom boom sauce" which added a nice spicy kick. All that, mixed with a rich beef jus, just create an amazing marriage of flavors that please the taste buds. I've never had anything like it in my life. This sandwich blew my mind with every bite. This sandwich was flavorful, spicy, beefy, and of course chickeney (is that a word?). It blew my mind with every bite. And when I was done, I wanted more. Not because it wasn't enough to fill me, but just because it was that delicious. I kept telling my wife for probably 20 minutes after finishing my meal how amazing that sandwich was. Seriously, I've had too many beef French Dips to count from all over the place, and this sandwich lands on my top 5 for sure - even though it isn't a "proper" French Dip! You have plenty of choices for sides - Cajun fries, green bean casserole, mashed potatoes (my choice), rice pilaf, veggies, grits, and more. The mashed potatoes were delicious and creamy, with a nice white pepper gravy. I travel the world for my job, seeking out French Dips everywhere I go. Little did I know one of the best dip sandwiches I have ever had was a mere 2 miles away from my house. Hmmm...I've got another coupon for a free delivery from Foodie Call. Maybe I'll do it again tomorrow! Whether you want to call it a French Dip or not (since it's a chicken dip after all), I call it a perfect sandwich.